Refurbished modern contemporary bungalow holiday home which sleeps 4-6 people in the main part of there house , with an option to sleep up to 8 in the mezzanine room above the snug for a small additional charge . The property is finished to a very high specification and well maintained by the owner ongoing. Perfect for holidays or weekends with family or friends. Designed to be a comfortable, relaxed and well equipped property, particularly suitable for families or friends holidaying together or in particular those with teenagers who need a bit of separate space. The house has 4 bedrooms -2 doubles and 1 twin in main part plus 1 x twin bedroom on the mezzanine above the snug area), 1 family bathroom and 2 en-suites. There is a large open plan living space with kitchen / lounge / dining area. The separate snug has bean bags and TV, an ideal space for young people to get away from their parents (or vice versa!). Above the snug is the mezzanine sleeping area with twin beds. The Bothy is located on a very quiet private lane only 10 minutes flat walk from Croyde Beach and the heart of this very picturesque village, which has plenty to offer the whole family. With off street parking for 2 to 3 cars depending on size and a private fully enclosed garden this is an ideal spot for a relaxing holiday. If you are feeling more energetic there is plenty to do and there are surf and body boards provided for your use as well as a table tennis table. The beach is sandy and flat and for the best part of the year has a lifeguard present. There are many activities on the doorstep including cycling, paddle boarding, golf, kite surfing, coasteering, horse-riding and volleyball. Croyde is located on the Coastal path with popular routes to Baggy Point, Woolacombe and Saunton Sands where you can also enjoy a delicious Devon Cream tea as a reward! This is a pet-friendly home so even the furry friends are happy. Croyde has always had a special place in our hearts because it such a pretty village. We fell in love the area many years ago as the beaches are amazing and the general buzz and friendly atmosphere around the village itself. The village is fairly small so easy to get around and has everything to offer including Bakery, Post Office, Ice Cream and Fudge Shops, Surf Schools and Surf shops, Cafés and Pubs. We particularly enjoy the cheesy chips at the Thatch and the pub food at the Kings Arms in Georgeham. Once you are in the village you don't need your car to get around as everywhere is within walking distance. There is also a lot of great cycling to be done either on the very hilly climbs out of Croyde or on the Tarka trail which is family friendly. The area is generally very dog friendly so they can have fun too. Location, location - a 10 minute flat walk to the Beach and 5 minute walk to the village centre, makes the house ideally located. Situated in a quiet private street with parking for 3 cars at the front of the property. Modern, well-equipped and safe - the property has bi-fold windows which open out the whole of the back of the house which is perfect for sitting out in the garden or having a BBQ. The garden is also completely secure, has an outdoor shower and is fully enclosed for pets and children. The kitchen is equipped with new SMEG and AEG appliances including a hob, fridge-freezer, double oven, washing machine, microwave and dishwasher. The living area is equipped with Bose bluetooth speaker, 40' Sony TV, Apple TV , DVD Player & DVDs, Family games and books. We do of course also have FREE WIFI but don't tell the kids!! There is also a 37' TV and Apple TV in the snug area. The fun stuff - Weber BBQ, 2 surfboards and a number of bodyboards, an outdoor table tennis table, and of course buckets and spades for the kids are all available for you to use free of charge. All the beds have high quality comfy mattresses like home from home - an essential when you are on holiday. We provide bed linen and all kitchen cleaning stuff like fairy liquid,cloths,tin foil etc for your use and a welcome gift for every guest. toilet, shower, Ensuite for Bedroom 1 but also accessed via the snug. Full central heating and heated towel rails in all Bathroom areas. Space for 2 cars to park in front of House. Small garage area which is used to as storage room for Bikes , Table tennis table and surf boards. Hand Towels and Bath Mats provided for Bathrooms, but guests required to bring their own Bath Towels and Beach Towels. Woodburner provided for those cold wintery days when you just want to huddle inside. A lovely bright lounge with sofas and Bean bag for seating and turquoise soft furnishings . A 40" Sony TV, Freeview, Apple TV, Bose docking station, DVD player and DVDs to view. Microwave it integral to oven. Some basic condiments are provided in the cupboard for guests to use including Salt and Pepper , sugar , tea bags and some sauces. all crockery provided including pots and pans , cutlery , all daily utensils, colander , ovenware dishes , oven trays, serving dishes , wine glasses , champagne glasses, plastic bowls & storage boxes. Completely new and fully equipped modern bright kitchen. Al facilities provided - dishwasher, microwave, fridge/freezer, cooker, washing machine, toaster, kettle, iron / ironing board and Cafetiere. Within the open plan kitchen area seating for 8-10 persons. Bose docking station - bluetooth facility. Box of Books and Magazines for guests to use. Family games available for use , including junior scrabble, Jenga, cards, YES/NO game. 2 Cruiser Bikes for use for riding about the village. You can play outdoor tennis at the Unison Holiday Resort which is 5 minutes walk from the house. You need to check at the reception to book. Saunton Sands Golf Course is 5 minute drive away and has 2 mature Links courses. It is a members course but welcomes visitors and Tee times are normally available on both courses. In the main I think the property is probably accessible for wheelchair users if they are not visiting on their own. There are a few steps to front of property and rear of property. The doors in the snug are slightly narrower than average size door. There is also a step down into the wet room. Dogs are welcome to stay at the property provided you check at the time of booking. There is a charge for dogs to stay. There is a no smoking policy in this property. Private parking to the front of the property for 2-3 cars. 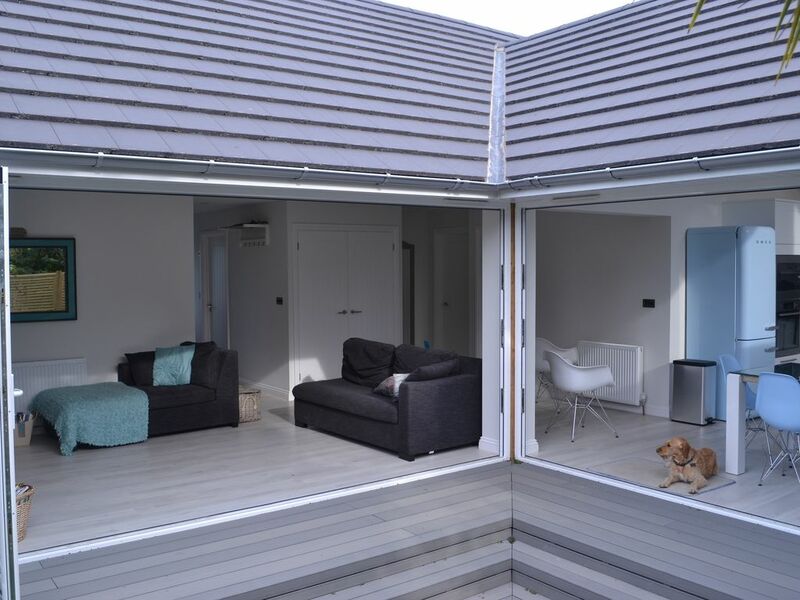 Good size private garden with decking from the kitchen & lounge areas and enclosed so suitable for pets and children. There is an outside hot shower for washing down Wetsuits and sandy feet when you return from the beach. Outdoor table tennis table available to use. Also body boards and surf boards in Storage room for use. Bed linen is provided plus Hand towels / Bath mats in the bathroom. All kitchen cleaning stuff is also provided including dishcloths and dishtowels etc. The property is cleaned once a week on changeover day (Friday ). All bedrooms have plush new mattresses and snuggly duvets for your comfort. Ample Wardrobe and storage space. The hall area is spacious with plenty room for storage of shoes and coats. We had an amazing stay at Bridgeford Bothy! Everything you could wish for and more. Love the natural products, soo comfy beds. Fabulous location easy access to beach and village plus coastal walks! The dog was worn out too! home from home, all great amenities supplied, scones on arrival! fantastic location, very comfortable beds, ideal for my disabled mother, a real find! couldn't fault a thing and the Mhorag was a great host. would definitely book again - thank you for making our holiday so special. Excellent property in a quiet and convenient location. Loved it. Very nice property which is very well equipped for a self catering holiday. The garden is well suited for small children which is fully enclosed with an astro turf lawn. The grandchildren enjoyed playing out there, and with the bifold doors fully open they didn’t feel cut off from the adults. The beach at Croyde is a ten minute walk away along a path, and we spent many hours enjoying the beach in the absolutely glorious weather. We ate out a couple of times in the village in the evening and one lunchtime and would recommend Blue Groove. The food is good and there is a children’s play area at the back. Couldn’t have been better. Everything and more you could want from a property. The garage full of goodies was great. Wetsuits, body boards and the table tennis were brilliant! Quiet, close location to centre. Very helpful owner. Can’t wait to stay again! The property has everything you could need, is very spacious and relaxing. Short walk to beach and village, and the beach was fantastic for the dogs. As well as the fantastic Beach and Surfing Holidays which this area offers the area is excellent for Walking , Cycling and also Horse- Riding. 10 minute flat walk to Croyde Beach plus 10 to 15 min drive to other local beaches Saunton and Putsborough. The nearest airports are Bristol, Exeter and Newquay. The nearest train station is Barnstaple which is linked to main line stations, this is about 20 minutes drive from Croyde. There is also local bus service to Braunton, Barnstaple and Ilfracombe. Georgeham - 3 miles away several nice friendly pubs. Woolacombe about 15 minute drive , excellent beach and surfing. Saunton and Putsborough Beaches are a 5 to 10 minutes drive and both long sandy beaches with dunes. Braunton ( Britain’s biggest village)with local with shops including small Tesco. Barnstaple about 10 miles away larger town with more shops including Sainsburys, Tesco, M&S, cinema, go karting, theatre and local Train station. The nearest Bank is in Braunton. Booking Notes: Damage deposit is £150 per week which is payable direct to the owner 8 weeks prior to the holiday . Extra Person charges - The property sleeps 4-6 persons and is rented on that basis , however there is room for an additional 2 persons to sleep in the mezzanine snug area. You can book the property for 8 at the additional cost of £20 per person per night . Dogs - A charge per night will be made for dogs £15 for med / large dogs , £10 for small dogs. Dogs are allowed on property at the discretion of the owner and must be declared on the Booking form. An additional pet deposit will also be taken of £100 to cover any possible damage / excessive hair . If the booking is made within 8 weeks of the start of the holiday then the full amount should be paid. Once deposits and final payments are made, they are non-refundable. Short breaks and Weekend breaks are also available , please ask Owner for details. Rates for Weekends may be subject to a premium rate. Find us on Facebook Bridgeford Bothy Croyde for more information and photos. https://www.facebook.com/pages/Bridgeford-Bothy/241813269286593?fref=ts Changeover Day: Changeover day will be Saturday. Arrival time is 4pm on day of arrival and departure time10am. A key safe is available for guests so late arrival is not a problem.